With the advent of digital photography, photo enthusiasts had been armed with some new tools provided by the digital technology. When you take a picture with your digital camera, the camera captures not only an image but also additional information (metadata) related to the place, time and the camera itself. This information is stored inside a picture file as an EXIF record (Wikipedia - Exchangeable image file format). Some of the most useful settings are Date and Time, Camera Position, Shutter Speed, Aperture (Wikipedia - Aperture), even your camera Make and Model just to name a few. If your are interested in photography and would like to be able view some of the metadata or edit it (you can add your name as an Artist/Author, fix the Taken Date or add a picture Title and/or Description) now you have an easy to use and FREE tool. 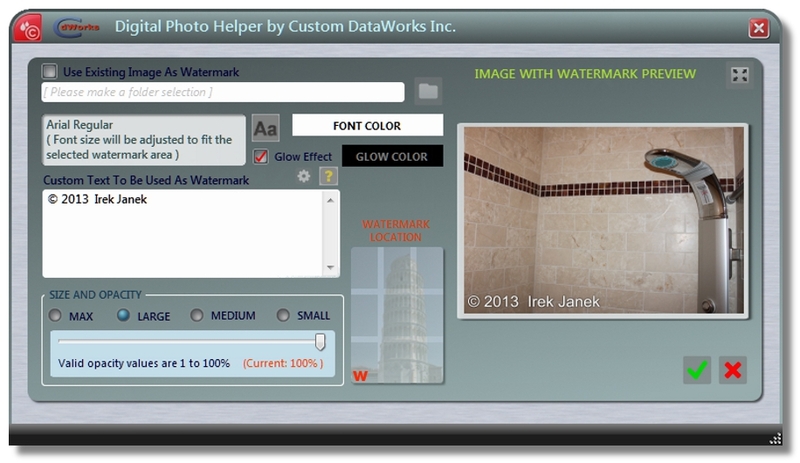 Our Photo Helper will even let you rotate pictures and add a copyright watermark with just a few mouse clicks. And if you upload your photos to social networks this is a must have tool for protecting your photos from being claimed and or shared by others. FREE VERSION today. 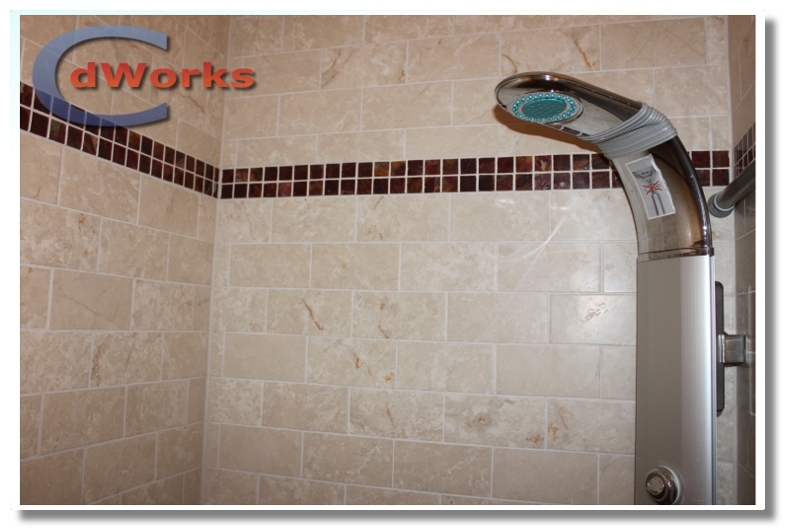 Create watermarks with either text or a graphic file from your computer, set the watermark opacity and place it on your pictures. Preview your final effect without modifying your originals, you can even see the preview in a "Full-Screen". You can do all that with just a few clicks of your mouse. 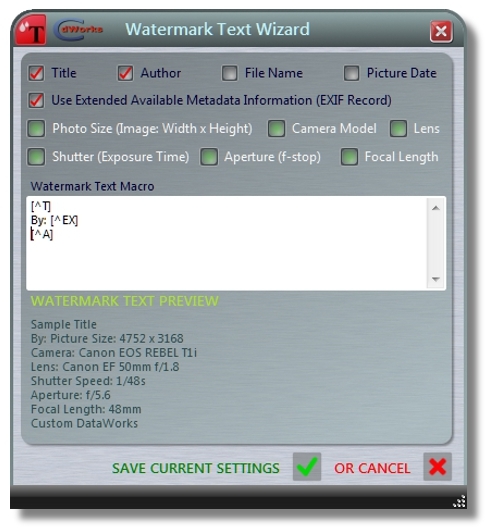 If you want to include some of the picture EXIF information now you can use "Watermark Text Wizard" to access the picture metadata and include it in your watermark. Generate the copyright message (e.g. 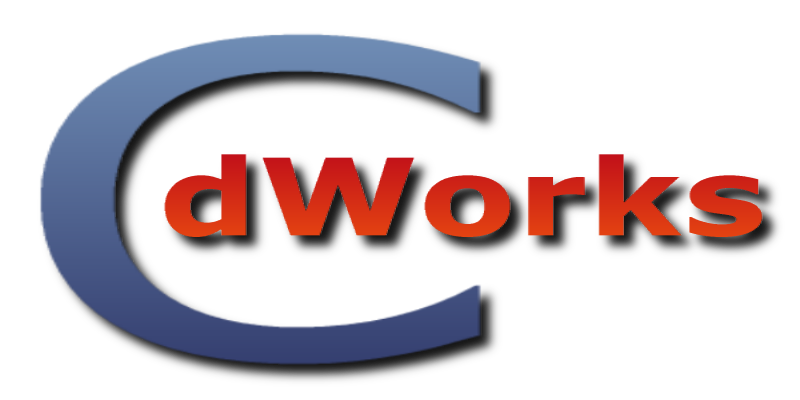 Copyright © 2012 Custom DataWorks Inc.) with just a single click of on a context menu (right-button click) For a quick look at the Watermark Wizard, Watermark Text Wizard and sample watermarks please click on the SCREENSHOT thumbs below. With the build 1.0.0.15 we introduce a new EXIF Editor. Now you can review ALL metadata lurking behind your favorite photos. With this editor you can also edit most if not of the EXIF fields (EXIF fields can change in the future as our cameras are getting smarter every day). See our editor in action on the screenshots below. If you plan on sharing your photos, in some cases it is a good idea to remove some or all of the metadata stored in the EXIF record (that includes thumbnail image of your photo). Samples of a data that you might not want to share with the general public are: GPS coordinates of the picture, personal information that you may have added to your photos, camera settings etc. With Photo Helper build 1.0.0.15 or higher, it takes just a mouse click to remove all EXIF information. Our Photo Helper allows users to load pictures from a folder with an option to include subfolders. Files are being filtered during the load operation and only JPEG files are loaded into a picture list table. Once the files are loaded they can be sorted by: File Name; Date Taken; Picture Orientation; File Path. Rotate photos 90 degrees clockwise or counter clockwise. While the pictures are being rotated the EXIF record information is being updated to reflect the new picture orientation. Some applications are using the EXIF information to auto rotate photos before they are being displayed. If the picture physical orientation and/or dimensions do not match. You can synchronize them with just a single mouse click. In some cases the date stored in the Date Taken field can be incorphhExifEdit01.jpgrect or missing (wrong date in camera date setting, pictures taken in a different time zone etc.) 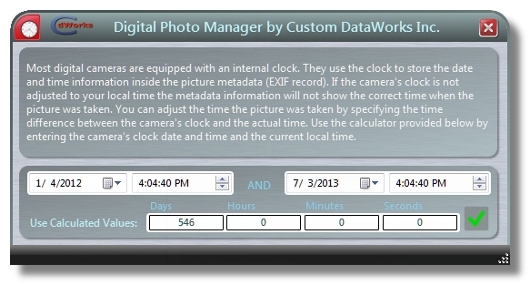 With Photo Helper you can correct/adjust the Date Taken field in the EXIF record by either entering a new date or adding/subtracting a time interval. 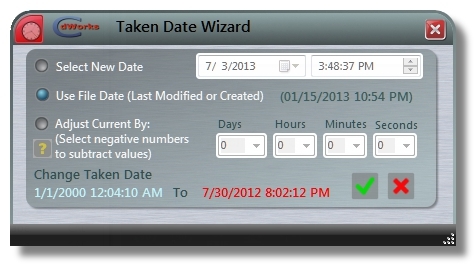 See the screenshots below for Date Taken Editor and Date Offset Calculator. Create / Edit Picture Title and Description. 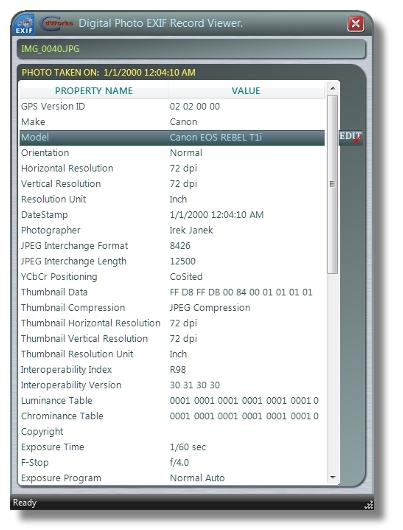 Some applications can read and use information stored in an EXIF Title field. When a picture is taken, cameras leave this field blank but if your slide show or watermark application is capable of using, it might be a good idea to fill it up. Photo Helper will even let you enter a title base string, add the picture date automatically and even a picture sequence number. You can also enter/edit picture EXIF Description field. 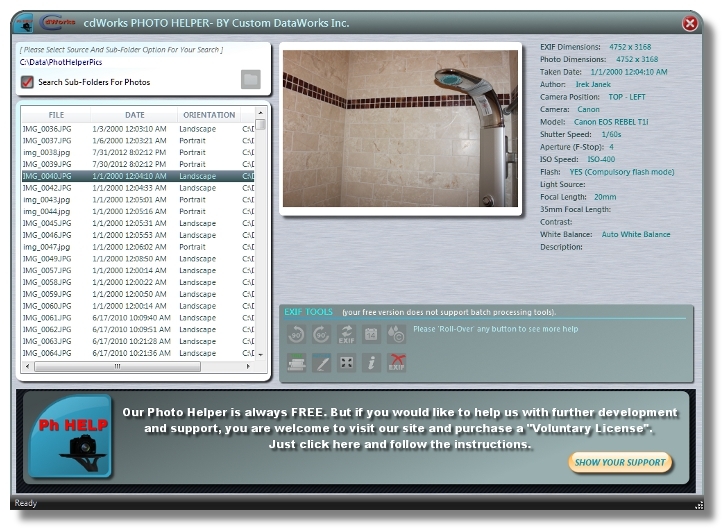 Photo Helper will remember your last entered Title/Description and pre-populate the dialog for each consecutive picture. It is always a good idea to sign (or even copyright protect) your work, if you want to do protect your pictures before you share them with your social networks Photo Helper provides you with an easy way to populate Author field in the EXIF record, it will also remember your last entered author and pre-populate the Wizard's dialog for each consecutive picture. 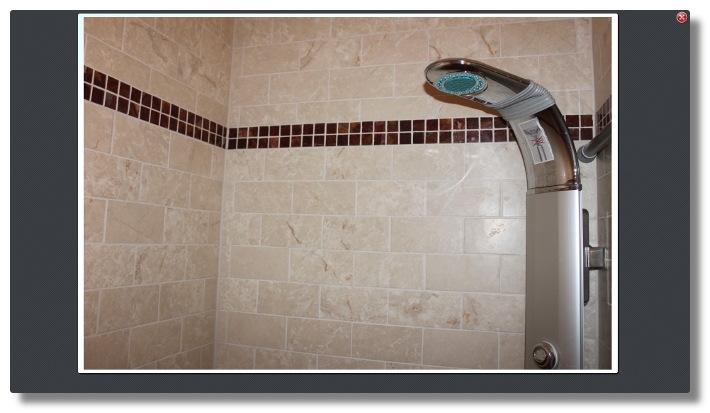 If you need to see a current photo in a full screen mode, with Photo Helper you are just one mouse click away. Photo Helper had been designed and tested on Microsoft® Windows 7® (64bit) and to take full advantage of all its features we strongly recommend installing it on Windows 7® (64bit). It is also compatible with the following operating systems: Microsoft® Windows XP® Home and Professional Edition with Service Pack 3 (32bit) or Service Pack 2 (64bit); Windows Server® 2003 with Service Pack 2 (64bit); Windows Server® 2008 (32bit and 64bit); Windows Server® R2 (32bit and 64bit); Windows Vista® Home Basic, Home Premium, Business, Ultimate and Enterprise with Service Pack 2 (32bit and 64bit). 1GB (2GB for 64bit operating systems) of RAM, 2GB (4GB - 64bit) recommended.